Don’t forget to check out my online course HTML5 Mobile Game Development for Beginners. Get 90% OFF! Only until the end of the month. This framework allows you to quickly create simple games that work regardless of the screen resolution of your device (laptop, phone, tv). You can play these games through HTML5 supporting web browsers, or you can turn them into native mobile apps using Titanium or Phonegapp, and submit them to the various “app stores” out there. We will thus cover these items, except for the “Story” one, as it’s really up to you to come up with something exciting. Some love for RPG games! 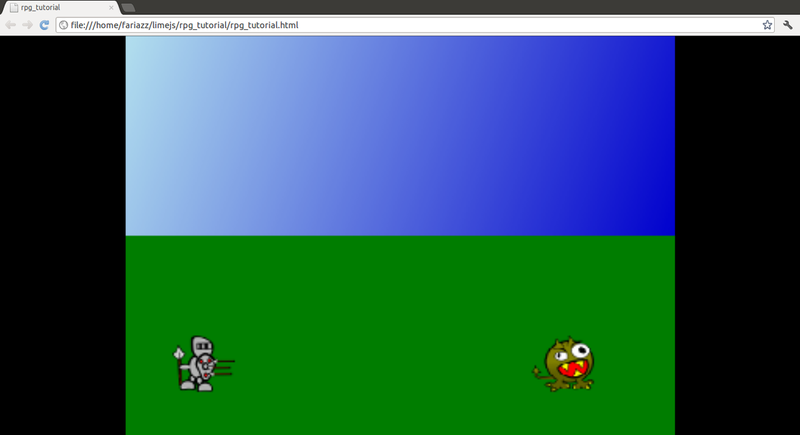 We’ll be using an awesome HTML5 game dev framework called LimeJS. This framework makes it easy to get started making your own games, as it comes with good support for aspects such as rendering images, user interaction for touch and non-touch screens, and many other game dev aspects (animations, 2D physics, etc). Moreover, LimeJS has a great and open community. In this tutorial we will not go very deeply into installing the framework or using all of it’s power. You can get the installation instructions from the official guide here. If you want a more detailed explanation of the installation process, I have created a full chapter on how to install the framework for Windows, Mac and Ubuntu in my video-based course Create HTML5 Mobile Games for Beginners, where you can also learn a lot more about how to create games with this framework. I’ll talk more about this course at the end of this tutorial. (this will download a bunch of dependencies) If you run into trouble installing LimeJS, the community is another excellent place to look for help and OS-specific guides. This will create a folder called “rpg_tutorial” in the limejs folder. That is where all of our files will reside. Keep in mind that if you move this folder anywhere else, the game will not run. This is because while we are developing, our project will need the libraries in our limejs folder. Once we are finished with a project, you need to “compile” it, and the resulting JS files you can put anywhere you want. A guide to carry out this process can be found here or in my course. 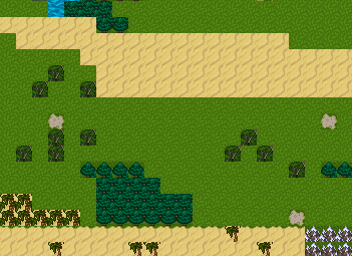 We’ll start by creating our world, which is an image made with this tileset. The tileset has been created by Sharm and released with the licence CC By 3.0, which means we are free to use this for any purpose we want as long as we keep this notice and give attribution to Sharm (thank you Sharm, whoever you are!). The game will have a resolution of 352×256. The game map has that same resolution (we won’t do scrolling in this tutorial). You can download the game map image from this link and copy it to your “rpg_tutorial” folder. What I’ve entered there is pretty much a basic skeleton for a new project. For a good introduction to all these elements there is the official guide and of course, my video course on this framework, where each element is covered in much depth through examples. We are telling the rest of the project that the namespace of the objects declared here is “rpgtutorial”. A namespace is a unique identifier which helps you distinguish the objects in this file from objects that could have the same name in other files (imagine you create a “Circle”, there is already a “Circle” object in the framework, but they would not be confused as yours would be “yournamespace.Circle”, whereas the one that comes with the framework is called “limejs.Circle”). Some objects are being imported so that they can be used here. Create the current scene, which is where the action happens. 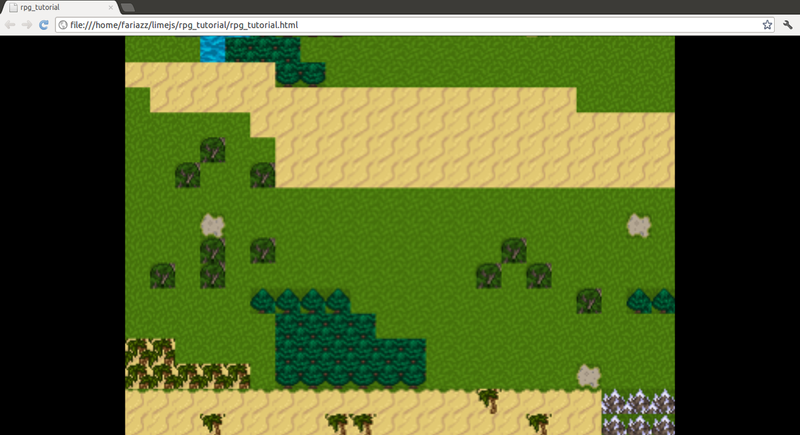 Now open the file rpg_tutorial.html in your web browser, you should be seeing the game map image. What we are doing here is creating a new Sprite object, which can be an image or just a rectangle with some filling (colours, gradients). An anchor point of (0,0) means that we’ll use the top left corner of the image to set it’s position (coordinates go from the top left corner of things in this framework, and with working with the Canvas in general). Position (0,0) means we are setting the image’s anchor point to the top left corner of the scene. Basically, the image will cover the entire screen. Notice how if you resize the browser window, the image will resize as well. Cool stuff. What I usually do as well is giving the “body” tag in the HTML file the colour black using CSS, that’s just my preference here. The “layer” that we created is an invisible container where we put the elements. A layer itself can be animated, moved, resized, etc. We are using the Canvas on this layer, as opposed to using the DOM. What would it be of RPGs without a hero? Who will then endure the vicissitudes of a decadent world full of monsters? Well, let’s create it then. What we’ll do is create a hero and have him move to wherever we click or touch on the map, how does that sound? We will use another Sprite object to represent the hero (I encourage you to create custom objects for each game entity). The image file we’ll use is labelled a public domain and can be downloaded here. Copy it to your rpg_tutorial folder. By using goog.events.listen we bind a game object (in this case the map) with events, in this case pressing the mouse or touching the screen. We create a new “animation” which is a movement to the target coordinates, which will take 1 second to complete. The animation is applied on the hero. We can check how it’s looking by having the Director putting it in place using replaceScene as we did earlier with “mapScene”. There is a lot happening here guys! We are using the scheduleManager, which will be executed periodically. The parameter dt contains the elapsed time between iterations. If the player is not already in the fighting scene, we are using Closure Library’s “Box” object to check for collision between the boxes of both characters (see how the bounding box of each is extracted). If the characters are indeed colliding, replace the scene. The setDirty() method is just a workaround for a framework bug when replacing between Canvas scenes. All ready! We have a pretty fancy fight scene in place, but what about the fighting itself? Well, you can create your own fighting algorithms involving all sorts of player choices, character attributes, items, etc. There is a lot of material online about RPG fights that you can use as inspiration. 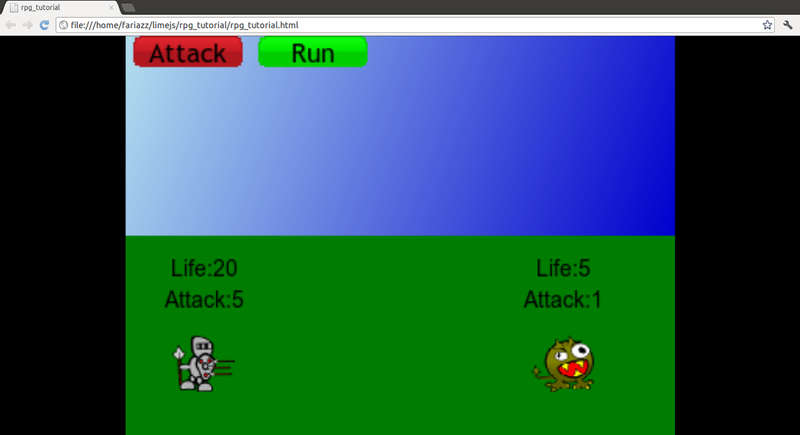 What I’ll do now is make up a really simple fighting algorithm, which will be basically tossing a random number and taking the “attack” attribute out of the enemy’s life attribute. But before that, let’s show the characters’ attributes in our fight scene, and add some fighting options. Let’s implement the “Run” behavior by binding the button “click” or “touch” with going back to the map scene. Add the following after the fight scene definition. //move the hero away from the monster, or the fight scene will be triggered again! Righto. We have a brave hero who can get into fights and run away from them. Sweet. Generate a random number, if it’s < 0.5, the player hits, otherwise the monster hits. When a character hits the other character, the attacker’s “attack” attribute will be subtracted from the opponent’s “life” attribute. If a character’s “life” attribute reaches zero.. he is then ready to be buried. We’ll implement this by binding the attack button to the “click” and “touch” events, and by running this simple fighting algorithm when any of those events are triggered. As I’ve mentioned earlier, you are very welcome to transform this code into something modular and scalable, and if you do so and want to share it with the world just let me know and I’ll add it to the tutorial, or you can also do it through the Github repo. We are listening to “click” and “touch” events on the attack button using the same technique we’ve used earlier. A random number decides who “hits”. Instead of being 50% each, you could make this dependent of the character’s agility or experience. If the monster is dead, we are taking their money ($$$) and killing the object. It a pretty unfair fight, as we are way stronger than the monster. If you happen to die I added a “game over” text to show up. Now that you know how to work with scenes, you could go to a game over scene. You can download the complete game files from this link. As I mentioned earlier, running these files outside the limejs folder is not gonna work. In order to deploy a LimeJS project you have to follow this guide. After doing this tutorial you are all good to get started with this awesome framework. The first thing I reckon you should look into is on making this more modular, for instance putting each game object in a separate file, and add some methods so that you are not repeating the code. Also, the fighting scene display and fight algorithm should be made generic to “any” monster instead of having one monster hard coded. Getting you into Game Dev was my goal here, not teaching OOP design patterns (there are plenty of tutorials for that out there!). Now where should you go next? I have an idea. I’ve prepared a comprehensive online course which will guide you through the creation of HTML5 crossplatform games using LimeJS game development framework. The course is 100% video based so that you can see in real time how games are created from scratch. Each lesson comes with its own zip file with all the code so that you can have a play with the examples and used them as starters for your own games. A lot of extra topics are covered in this course, such as adding animations, sound, 2D physics, using tile-based maps, and transforming your HTML5 game into a native app so you can make money with it. This course is about making a Zelda-style game demo that shoots evil ghosts in a creepy forest. Created in collaboration with Jacob Deichert, this course is a great start into using the Canvas to make browser games. If you liked this tutorial, check out the course at the Zenva Lounge. I would like to thank you for sticking around and will see you next time!